Town & Country’s program consists of a 10-month school year from September through June and two Summer Sessions, one in July (4 weeks) and one in August (3 weeks). 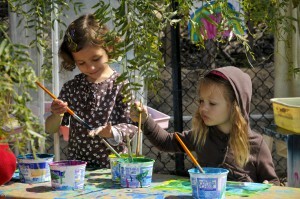 The heart of our day is a three-hour morning program from 9:00 am to 12:00 pm divided between indoor and outdoor play. Children turning three years old may choose a 2-day (TTh) or a 3-day (MWF) schedule. Four year olds may choose a 3-day or a 4-day (various choices) schedule. A child’s school day may be extended into the afternoon Lunch Bunch from 12:00 to 2:00pm on Mondays and 12:00 to 3:00pm Tuesday through Friday. Families may choose to extend their child’s stay for any portion of the afternoon. The morning program is a more structured learning experience while Lunch Bunch allows for both free play and enrichment activities (Language Arts and Motor Skills). Classes meet indoors for half of the morning and out of doors on the playground for half of the morning. Our curriculum is developmental and play based, assessing and building on the children’s interests and talents while helping them to grow in capability, confidence and independence. T&C is a partner in the Outdoor Classroom Project, dedicated to increasing the quantity, quality and benefit of outdoor experiences for young children. Our staff is committed to helping children connect and discover the natural world and the breadth of activities that are available outside. Town & Country provides a mid morning snack each school day. When your child comes to school, we recommend providing her or him with tennis shoes and “old” play clothes – safe for climbing, trike-riding and easy for the child to put on and take off and fine for painting, sand and water play – and easy for the child to put on and take off. Our learning can be messy. Town & Country has created an afternoon program that operates on Tuesdays through Fridays (4 days) for 4 year olds. It runs from 12:00-3:00pm and these children bring their lunch from home as they join the morning children who are staying for the Lunch Bunch program. 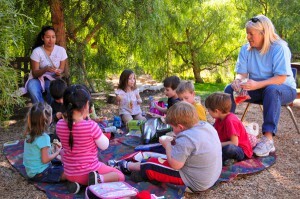 The afternoon class has the same program as in the morning with time divided between indoor and outdoor experiences. A daily snack is provided around 2:00pm. Children staying for Afternoon Lunch Bunch bring their lunches from home and socialize with their classmates until 12:30pm after which there are playtime and enrichment classes, either in the classrooms or the play yard. An afternoon snack is provided around 2:00pm. Lunch Bunch continues until 2:00pm on Mondays and until 3:00pm Tuesday through Friday. Parents may come for their child at any time during the afternoon and are charged at $12.00 per hour. Or you may pre-purchase the LUNCH PASS which will allow an $10.00 per hour rate. You may pay as you go each afternoon, “charge it”, or “pay ahead”. Please check in with the office when you come to pick up your child. Summer Sessions in July and August consist of a three-day program on Tuesdays, Wednesdays and Thursdays of each week for all students enrolled. Summer programs are available to new students admitted through the Lottery as well as graduating students. Children are grouped by age and the curriculum is thematic including such topics as What is in the Ocean? All Kinds of Animals – Pets, Zoo, Farm and Jungle; What Do We Know About Space? A Kindergarten Prep program is also offered to help prepare students for the transition to Kindergarten. Early Birds is a before school program offered throughout the year which begins at 8:00 am Monday through Friday. A Town & Country teacher provides early care in one of our classrooms for families who need this. Each child is a $10.00 charge for any portion of this hour, payable to Town & Country like Lunch Bunch.